– Build on the unanimous support (parliamentary motions of 2010) and the recent appeal by 5 former disarmament ambassadors for Canada to act on its support for nuclear non-proliferation, especially since the US has belied its professed support for nuclear disarmament by increasing its arsenal, even developing a “mini” nuclear bomb, during the Obama administration. – End Canada’s participation in NATO, which has been acting in an aggressive and provocative manner for decades. 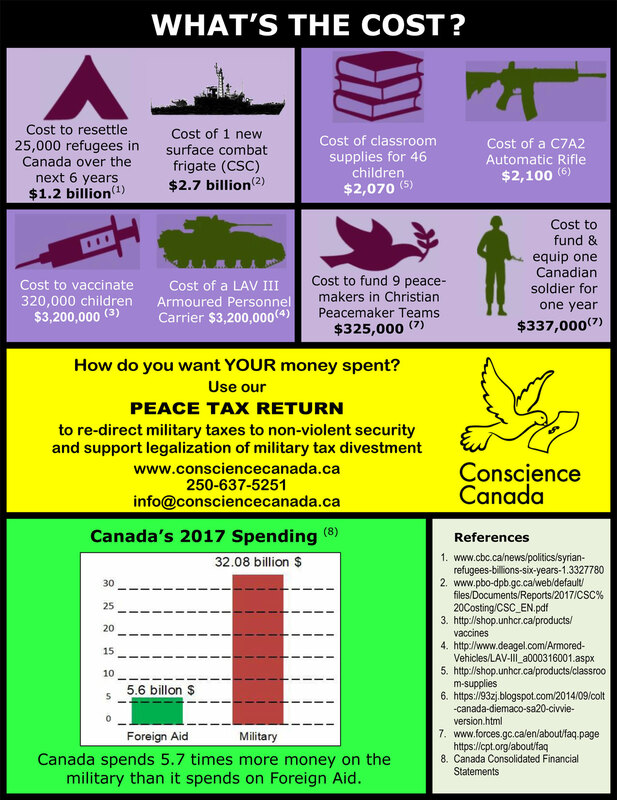 – Provide non-military training for Canadians who want to help build a more peaceful world, in programs such as Katimavik and the Nonviolent Peaceforce. 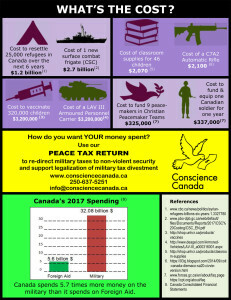 Before he became prime minister, Justin Trudeau expressed support for the Nonviolent Peaceforce program; we expect that most Canadians would support programs designed to increase our capacity to use nonviolence for positive change if they knew more about its history and potential. We agree with others who have participated in this consultation, that this defence policy review is a great start, but that it cannot bring about the kinds of changes we need unless it is linked to a wider review of policies regarding our economy, our place in the wider world and the current social and political context. We support suggestions aimed at upholding international law and directing Canada’s efforts towards protecting civilians. In particular, we encourage the Department of National Defence to re-engage in efforts to rid the world of mines, as Mines Action Canada advocates. And we hope that the DND will stop engaging in actions that jeopardize people’s health and well-being. In particular, it should stop sending contaminated fill to a site which drains into the Shawnigan Lake watershed. In closing, we cite Rachel Carson’s vision of the challenge of our times, and John Ralston Saul’s summation of Canada’s roots and the tension we face as a result of who we are. May we choose a defence posture that takes these views and realities into account. The Independent Commission on Disarmament and Security Issues. Common Security: A Blueprint for Survival. New York: Simon & Schuster, 1982. The Commission, initiated by Prime Minister Palme of Sweden, brought together leading figures from the Soviet Union, Europe and the United States at the height of the Cold War. Their Common Security alternative provided the paradigm which led to the negotiation of the Intermediate Nuclear Forces Agreement which functionally ended the Cold War in 1987, before the collapse of the Berlin Wall and implosion of the Soviet Union.